Tempting though it may be for those of us in the peanut gallery to rattle on about who won and who flopped in the Leaders Debate, the really important question is this: did we learn anything new about the men who would be king, er, prime minister? Everyone but Harper agrees that Canada is in a recession. The fact is Harper ran up eight consecutive deficits and added $150 billion to the national debt. Harper says our economy is healthy. Just look at the Stats Canada numbers—Canada created more net new jobs than any other G7 country. And we have a balanced budget. May rebutted Harper’s argument by saying he’s cherry picking the facts. Net new jobs is not a valid indicator of economic health because Harper failed to correct for population growth. Yes, Canada created more jobs than Germany, but that’s because Canada’s population is growing and Germany’s is not. In fact Canada is doing very poorly compared to the other G7 economies. May also accused Harper of faking a balanced budget by delaying it until April 21 so he could book the proceeds from the sale of the GM shares. But oil prices continue to slide and at the end of the day the budget will not be balanced. Everyone is going to fix the economy by fixing the middle class. Harper dusted off MacKenzie King’s family allowance plan (Harper calls it the Universal Child Care Benefit plan, my Mom called it the baby bonus). This plan will cost billions and assists wealthy families who don’t need it. Otherwise he’s staying with the status quo. Mulcair is offering one million families day care at $15/day and will boost the minimum wage to $15/hour. The minimum wage deal sounds good but it only applies to people who who work in federally regulated jobs. He won’t raise personal income taxes on the wealthy but will raise corporate taxes for large corporations. Trudeau is offering a child care benefit plan and tax cuts to middle class families. He’ll increase income taxes for the wealthy. Harper and Trudeau roundly criticized Mulcair (and May) for proposing a tax increase on large corporations, saying this would be a “job-killer”. So the question becomes which makes more sense: increasing personal taxes or raising corporate taxes? Once again May provided the best rationale in support of raising corporate taxes. When Jim Flaherty cut corporate taxes he expected companies to use the tax savings to create growth. They didn’t. They horded it and are now sitting on $630 billion in cash—an amount equivalent to 32% of GDP. Mark Carney called this “dead money”. So if corporations won’t spend this cash growing the economy they should give it back so the government can use it for growth investments. Harper walked into a buzz saw when he said that under his watch Canada lowered its greenhouse gas emissions and energy projects are moving through the environmental assessment process. May responded by listing all of Harper’s broken promises. Mulcair described all the environmental laws he’d gutted and Trudeau summed up the credibility issue with a succinct comment: “Mr Harper, no one believes you.” No kidding. The three opposition leaders propose different solutions to the “pipeline problem”. The Greens want upgrading in Canada and oppose all pipelines that carry unprocessed bitumen through dangerous routes to countries with weak environmental laws. The NDP say each pipeline must be objectively evaluated by a credible environmental assessment panel, ie. not Harper’s rubber stamp panel. They want more upgrading in Canada because it provides jobs. Trudeau argues pipelines will proceed if they have the requisite “social license”. Unfortunately the social license argument only confuses the issue further. Which brings us back to where we started. Harper lacks credibility. His refusal to act on climate change and his decision to gut environmental legislation damaged Canada’s ability to market a critical resource internally and abroad. It will take tremendous effort to right the regulatory ship given the mess Harper made of it. Trudeau and Mulcair got into a bun fight over Mulcair’s statement that a 50% plus one vote was enough to allow Quebec to separate from Canada. Trudeau accused Mulcair of pandering to the separatist vote. Mulcair goaded Trudeau to name his number. Trudeau snapped back with “nine” (referring to the nine Supreme Court judges who said separation required a “clear majority”). May dryly noted that the discussion was supposed to be about civil discourse and cooperation across party lines. That comment refocused the debate on the topic of fixing democracy. Atta girl Liz. Both Trudeau and Mulcair say they want to replace the “first past the post” system with some form of proportional representation. 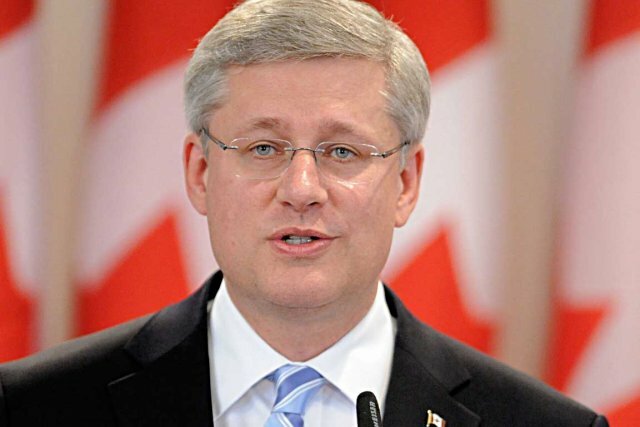 Harper refused to consider it without a referendum, noting that all provincial referendums on the issue have failed. What shall we do with the senate? Trudeau disavowed the Liberal senators months ago, so he’s done. Mulcair wants to work with the provinces to abolish the senate (good luck with Quebec who won’t hear of it). Harper refuses to appoint new senators hoping that the Senate will wither away. May says this is unconstitutional and whoever told Harper otherwise should go back to law school. Meanwhile Harper continues to use the senate to further his agenda. May and Mulcair say the biggest senate scandal isn’t the Duffy affair, but Harper telling the senators to kill a bill that had been passed by the elected House of Commons. Harper downplayed the incident saying he simply told the Conservative senators to support the party’s position and they were free to vote in accordance with their principles. What principles? In other words, the whole thing is an ungodly mess. Harper and Trudeau agree that it’s the prime minister’s job to keep Canadians safe and protect their rights and freedoms. Everyone disagrees on how this can be achieved. Harper passed Bill C-51 to modernize Canada’s security systems. He rejects the idea of parliamentary oversight, preferring to rely on a committee of “independent experts” chaired by “prominent former judges”. Trudeau said he supported Bill C-51 because he wanted to make amendments in committee. He plans to make more amendments if he’s elected. May and Mulcair want to repeal Bill C-51. Mulcair says it erodes our rights and freedoms and adds nothing to the existing legislation. May says it makes Canada less safe and quotes Joe Fogerty, an MI-5 agent working intelligence liaison, who says Bill C-51 is a tragedy waiting to happen. I’m with May and Mulcair on this one. Right. Two minutes left to wrap it up. The closing remarks ranged from predictable to flakey. HARPER: No one, repeat, no one has the experience necessary to keep Canada safe and the economy on track. In other words, forget all that nonsense you heard about lackluster economic growth, creative budgeting, deficits and debt; those other guys are going to raise personal and business taxes to feed a government that can’t control its spending. Oh and Canada is the greatest country in the world. MULCAIR: Canadians have a clear choice: Harper’s failed plan or Mulcair’s plan for positive change. The NDP will kick start the economy, get Canadians working, invest in small business, local infrastructure and the environment. Canada is the greatest country in the world. MAY: We need more debates to discuss social policy, the Truth and Reconciliation findings, pharmacare and the growing gap between the rich and the poor—the 86 richest families in Canada have the same combined wealth as the poorest 11 million Canadians. The Green party isn’t a one-note party. It’s running strong candidates who will work collaboratively across party lines to get things done. (If they’re anything like May, she’s right). TRUDEAU: Forget Harper’s attack ads. You can decide whether someone is ready to be PM by asking them why they want the job. Trudeau wants his children to grow up in the best country in the world. He says to be PM you must love Canada more than you crave power. He closed with an inspirational, if somewhat confusing, comment: “We are who we are, Canada is what it is.” And we’ve always know better is possible. This was a great debate. Voters had a chance to line up the candidates and compare their policies and performance. May is very smart and willing to work collaboratively across party lines. Mulcair’s platform is appealing but he didn’t explain it as clearly as he should have. Trudeau is articulate but vague. He needs to resist the urge to duke it out with the big boys. And Harper, well, Harper is very much in charge, but I sincerely hope he won’t be in charge for much longer. This entry was posted in Politics and Government and tagged Election 2015, Elizabeth May, Harper, Justin Trudeau, Leaders Debate, Thomas Mulcair. Bookmark the permalink. Again, none of the opposition parties even mention repealing Harper’s destruction of the Federal Fisheries and Navigable Waters Act that used to protect fish habitat (poorly). Canadians need new & improved legislation to protect and repair the damage to renewable resources and stop the sinister impacts of cumulative damage to our watersheds. In the Eastern Slopes most of are native salmonids are rated in some category as ‘Species at Risk’ or worse (bull trout, west slope cutthroat and Athabasca rainbow trout, Arctic grayling & even pygmy whitefish. Actually, one of them did; IIRC it was Mulcair, when he was talking about the Energy East pipeline proposal, and the regulatory hurdles it must cross to be approved. It was a very brief, passing reference, so it’s not surprising you missed it. Yes, that’s right. Mulcair referred to these acts when he called for a “sustainable” environmental assessment process. He went even further on Sunday when he attacked Harper for gutting environmental legislation (presumably Mulcair would un-gut it) and raised the bar even higher by saying he’d introduce polluter pay legislation forcing companies to pay for damage they caused. He also said environmental assessments should include an analysis of whether or not the project allows Canada to meet internationally agreed upon GHG reduction targets. Jill, Elizabeth May was the most impressive leader at the debate by a long shot. She’d be a great PM. I agree Elizabeth May could be, by far, the best PM of the lot. Island (and sell me her place, please!). May is wasted (pardon the unkind pun! and let anyone not so guilty at least once throw the first rock) on the Green Party! Perhaps, cannot realize her full potential or make her full contribution would be better, but not as much fun, as “wasted”. The picture essay, the formidable…, the smiling…, the mature… and then… the same old Harper just cracked me up! Thanks for the chuckle, Ms. Soapbox! ABCanuck you’re very welcome. I wondered whether anyone would read the captions beneath the photos. I should have realized they wouldn’t slip by you. I enjoyed your “wasted” pun…very clever! It says a lot for May’s character that we’ve accepted it as a temporary aberration and moved on. I have always been impressed with Elizabeth May’s articulate and well-informed contributions to debate. Respectful support from Stephane Dion facilitated Elizabeth May’s electoral success. Timing was wrong, in my opinion. Did we not realize the fragility of our democracy and its future? If May wants to be PM, she would be a welcome addition to one of the parties that most closely aligns with the principles of importance to her. Until then, she will continue as the spoiler that siphons off centre-left support and inadvertently supports the cons in their desperate grip on the trajectory that takes Canada to a full Randian “objectivist” future. May’s influence is reminiscent of the Ralph Nader run for the crown and indirect facilitating success of George W. Bush … but at least Nader only did it once! I sat in front of my TV and tried real hard to understand what was being said. I guess I am just too simple minded to grasp the big picture. I wish they would just be plain and simple. I will try to do this, that, or whatever instead of constantly pointed out what the other guy did wrong cause I already figured that out. Please tell me what you are going to do right for the “simply folk” who have to figure out how to survive on $50,000 a year or less. There are lots of us out there. Thanks for the recap cause now I understand more than I did before. Rose, you’re right about the baffle gab and finger pointing. The first part of the debate when they were arguing about the economy was especially bad. I wondered how Harper, the economist, could reel off a string of numbers and say they prove the economy is just fine. Then I remembered what a smart CFO told me about data. He said if you torture numbers long enough they’ll tell you exactly what you what to hear. Elizabeth May called Harper on this when she said he was “cherry picking” the data and “faking” the budget. Thank god she was in the debate. She should be in all of the debates to keep them honest! I agree with Rose MacKenzie – Kirkwood. That’s why, and I say it again, I liked the late Jack Layton, because he spoke and I understood. I get the feeling, and I had this feeling with Brian Mulroney, that the Conservatives especially Harper, will sell out our country if it means making a buck. He doesn’t care about the middle class. The only thing he cares about is staying in power, and THAT’S scary. Thank you for the re-cap. It helps. I know which party I’m leaning towards. Joanna, I believe Harper will sell out our country in a heartbeat if it means big business will prosper. Elizabeth May said Harper sold Canada sold down the river when he signed the trade deal with China. He signed that deal without a single committee meeting in the House and we’re stuck with it for at least 31 years. He’s trying to do the same thing with the TPP and it’s only because the US agreed to a side deal with Japan that damages our auto industry that he hasn’t already presented us with that deal signed, sealed and delivered. This is not the kind of treatment I expect from our PM. I must say, I was pressed by Ms May. I’ve also reviewed the Green Party’s detailed policy document, Vision Green 2015, and on the whole agree with most of it. There are a few areas where I have quibbles; for example, they are a bit too fond of pseudo-scientific “alternative health care” for my tastes. But by and large, their policy proposals are far more courageous than the timid, incrementalist NDP’s (full disclosure: I’m a card-carrying New Democrat). I’d really consider voting Green this time around, if it were not for the fact that our local candidate is a flake (I know him from when he was a New Democrat, and he has no credibility). Jerry, Elizabeth May was amazing, especially since Paul Wells, the moderator, let the guys talk over her. He should have done a better job ensuring she had a chance to speak. Nevertheless she made her points very well. I guess you can do that when you’re interested in telling Canadians the truth instead of simply blowing your own horn and trashing the other guys. The only thought I had at the end of this debate was that we are in deep trouble in Canada. Even with all the resources we have and all the education, with this kind of leaders we will go nowhere. The only one I would vote for is Elizabeth May, only because she does not lie and she knows quite well what the real issues are. Unfortunately with the First Past the Post system she will get tops 3 seats. In a real voting system and with an average of 7% and a 305 seat parliament she would get at least 21 seats, which is quite different and would allow her to improve and make sure that the prime ‘minster’ does not lie too much. Mr. Mulcair sounded to me like a pharmaceutical sales rep and Justin Trudeau sounded like me when I was desperately looking for a job when we went to the same oil bust in 1983 and had a baby at home that needed to be fed. Harper, just like Brian Jean here In Alberta cannot get out of the ‘no raise taxes’ mind loop. They are both very sick and need desperate psychological help. In the meantime, like you mentioned, he added 150 billion to the debt. I would like to understand how, as an economist, he justifies that adding to the debt is better than raising taxes. In the end we will pay one way or the other. The main problem is that somehow we have made a horror story about the budget. The fact is that we have to live within our means and it is not difficult to understand. It works like the budget I have with the gas company. We pay a certain amount every month and at the end of the year if we spend more the budget increases the monthly payment, if we spend less, they decrease the monthly payment for the following year. It does not take a doctorate to understand that. So taxes should increase and decrease according to our behavior as a society and what we spend. Summarizing, I really do not feel like voting for any of them. I am done with this show of disturbing aggressiveness at the end of every 4 years. When I was a kid I always thought that to resolve issues as difficult as the ones we are facing we seriously need to get all together and get on one road to a better standard of living for everyone. Why are using this completely outdated British system that does not work even where it was created. Enough of this nonsense. If they want to show the country who is the strongest, please do not organize a debate. Get the Rexall Place and get them in the Sumo wrestling uniform and let them fight until only one is standing. It would be way more entertaining and would save us a lot of time and money. Carlos, your example of how May would benefit from an electoral system that wasn’t First Past the Post was very enlightening. Can you imagine what she could accomplish with 21 MPs? Both the NDP and the Liberals say they’ll introduce some form of proportional representation, but neither says what it will look like. Given the growing interest in moving away from FPTP it would make sense for both of them to outline their proposal so we could compare them and then decide which of the two parties to vote for. Although having said that I don’t think I could vote Liberal because I vehemently disagree with how they’ve handled Bill C-51. I loved your suggestion that we just do away with all the razzle dazzle and put the candidates into Sumo wrestling outfits and let them duke it out. And while the guys are busy trying to flip each other, Elizabeth May will be engaged in quiet conversation with the spectators convincing them to vote Green. It’s perfect! Fantasizing on what could be happening so that Elizabeth May comes up the winner is not helpful to a blog that I have come to see as resourceful and worthy of note. Susan, I hope you will check up on the facts of what is happening with C-51 from a Liberal perspective. The position taken in the House has been reviewed and found to be less than ideal, as I understand it. Mulcair has given two or three accounts of what he would do with C-51. Don’t let one political posturing position from a third party neophyte blind you to everything else. We all need to be given opportunities to learn. Look at the cadre of excellent Liberal candidates across the country coming forward to run with Trudeau. Look at the likes of Ralph Goodale et al who will be there in the heat of debate on the issues of governance. Look at the history of what has been accomplished in Liberal governments and honourable Senates in the past. The strong Liberal politicians who have stood for the greater good in the past are there backing the current team and will be available as experienced resources. Trudeau is gathering support from the younger generations and making a comfortable, personal connection to people in every corner of this country. Please don’t write him off just yet!! Jane, thanks for the reality check on May. If she’s lucky she’ll add a handful of MPs to her caucus, but obviously nowhere near enough to put her in the prime minister’s chair. One can only hope that either the NDP or the Liberals get in with a majority and move ahead on their promise to scrap first-past-the-post and replace it with proportional representation. That would give May a greater presence in the House and could allow her to accomplish more. I’ve talked to my Liberal friends and some Liberal candidates about C-51. They’ve given me two explanations. The first is that Trudeau supported C-51 so that he could attend in committee and fight for amendments. This puzzles me because supporting the bill isn’t a prerequisite to being allowed into committee to suggest amendments. Both the NDP and the Greens appeared before the committee and suggested amendments (which were shot down). The second is that Trudeau wanted to be cooperative in an effort to improve the bill for the greater good of all Canadians. I’m not sure I buy this one either. However, it is early days. A lot can happen between now and Oct 19. Susan 21 seats with a smart and honest person like Elizabeth May would turn the house on its head and that is exactly what we need. I know that both Mulcair and Justin Trudeau have talked about Proportional Representation but I do not believe they are actually truly committed to it. I have contacted both and I got the usual cold reception especially from Justin Trudeau that told me he does not like PR. This change of heart to me is just vote catching because it seems PR is becoming fashionable in Canadian Politics. I certainly am not interested in fads. I would like this to be a serious issue that should be discussed in depth. Unfortunately our leaders prefer the possibility of majority with 39% of the vote. It seems to sound way more democratic to them. All I can say is that it is dumb not to consider it in this election, as an important issue, and it just shows the lack of interest on anything that does not bring immediate votes. Just like in the US, and launched this morning, we need to have a referendum on changing our democratic institutions and rules drastically. The current system is becoming a joke. There is nothing democratic other than the act of voting itself. This is how desperate people are. It is a good try in my opinion. Thoughtful and balanced assessment. Just what we’ve come to expect from you, Susan! Thanks David. You’re a good example of someone who strives to remain objective perspective as well. The words “balanced budget” never mean anything to me. After all, who drew up the budget anyway? Not me, not you! Was it an Independent? All jibber, jabber! Or “bun throwing” as you called it! Thanks for the clarification. For the political junkies like myself – here is a three part series from Real News that I enjoyed. Living in the riding next to that of Elizabeth May has given me an opportunity to see her in action. Of all the candidates in the debate, she differed from the other leaders in placing country ahead of party interests (a term used frequently used by Kenneth MacNaught, a history professor from whom I have learned so much) that has resonated with me . She can certainly afford to do that but it runs deeper than that. I don’t think anyone will win a clear majority and if that is so, I believe that Elizabeth May could well serve as a voice of moderation between Mulcair and Trudeau because of her proven willingness and ability to work with members of all parties. Her participation in the debates is crucial and that was certainly evident in the debate. She can crack open the tightly guarded and disciplined, controlled, manufactured approach and practiced/deployed by Harper and force issues to become public, issues such as the ISDS clauses that proliferate in camouflaged so called free trade agreements that undermine the will of the people in areas such as the environment, health care, pharmaceutical companies, agriculture to name but a few. In my view, it is imperative that she be included in the stridently elitist Munk debate and I, for one, will be writing them again to press the issue. Their position that only leaders of parties (with 12 or more seats) pales in comparison to the richness that May can bring to the debates and we need that now more than ever. Right on Ted. The best part to me is the manufactured approach. All of Harper is a manufactured behaviour – the market fundamentalist Borg. I agree with Ted’s description of Elizabeth May but couldn’t express it so clearly. I also understand the need to limit leaders of fringe parties, to avoid irrelevant debate. Perhaps even elitist debate organizers would change the rules to allow any party leader with 5 or 10% of the popular vote to qualify to debate at least until the voting system is changed. Do you have an email address for the Munk debate organizers? I couldn’t find an email for the Munk debate organizers but but here’s a link to another group pressing for the same thing. http://www.thepetitionsite.com/152/441/251/let-elizabeth-may-in-the-leaders-debate/ The more petitions we sign, the better. I agree with Susan that this debate doesn’t matter and in fact, most debates don’t. The only thing debates do is solidify people’s already held perceptions. The poor debate performance of Mitt Romney against Barack Obama wasn’t as much of a factor as his 47% comment, nor did John McCain’s poor performance matter as much as statements that showed how out of touch he was with the public. In Canadian politics, the debate between Mulroney and Turner is said to have made a difference, but in actual fact, the public had already decided to defeat the Liberals after 16 years in power. I do think that Rachel Notley’s performance did in fact help undecided people something of her personality(they certainly saw her superior debating skills). In the case of Harper, there are signs of his vulnerabilities and that is shown in the surge of NDP support. If you follow threehundredeight.com, you can track the polling. One that is shown is that the support for the NDP is not solely based on the popularity of Jack and that they have been able to build a base in Quebec and other places. It also shows that while people like Trudeau(and he doesn’t seem like good bloke)he doesn’t have any depth. People who are wanting change are hesitant about voting for Trudeau and many see Mulcair as a better leader. Time well tell what is correct, but I think that Harper has the most to lose and will have to watch for the knives that will come out after the election. Sitting watching her I just couldn t shake the feeling she was one answer away from a Sarah Palin moment. Asked what qualities she had in comparison to the SNP leader she answered I m a woman , and then paused.